Orlando Timeshare Specials and discount Orlando Vacation Packages. Great discounts on hotels and Timeshare Resort accommodations and attraction tickets for your Disney World® Vacations. Some of our hotel vacation packages include $200 worth of Attraction Tickets to either, Disney World ®, Universal Studios ®, SeaWorld ®, Islands of Adventure ®, Dinner Theatres, Water Parks and more. When visiting Disney World®, don't miss the opportunity to experience Timeshare Resort accommodations at its best. Silver Lake Resort, a magnificent vacation resort for the entire family, is located only 2 miles from Disney World®, and only 10 minutes to the other main theme parks in Orlando. Choose from comfortable studio units to spacious two bedroom grand villas that sleep up to 8 people. Some villas offer fully equipped kitchens and jetted tubs. Guests enjoy a scenic lakefront setting, numerous swimming pools, watersports, basketball and volleyball courts, and a full schedule of family activities. 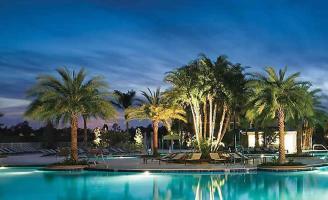 Orlando Florida Preview package at Calypso Cay Resort. Enjoy your stay in a 1, 2 or 3 bedroom condo unit at this magnificent vacation resort in Orlando and experience its state of the art facilities. During your visit, you will be required to attend an informative 90 minute sales presentation of Calypso Cay Resort, offered at the beautiful and well appointed sales gallery at the resort. Westgate Vacation Villas offers the finest in luxury accommodations just minutes from the main entrance to Walt Disney World® Resort and within close proximity to Universal Orlando® Resort and SeaWorld® Orlando.Guests enjoy 14 swimming pools, a fitness center, lighted basketball and tennis courts, volleyball courts, and a game room. Great Orlando Promotional Packages with Accommodations and Attraction Tickets, provided at The Inn at Calypso Cay, located at the heart of the beautiful Calypso Cay Resort. Now featuring Castaway Cove, a high action adventure park bringing thrills and excitement for all ages. staySky Suites I-Drive Orlando With its terrific amenities and opportunities for recreation, staySky Suites I-Drive Orlando hotel near the best Orlando attractions is the perfect family destination. Our features include a sports court, barbecue, game room, fitness center and outdoor pool and hot tub. We offer free hot breakfast buffet and a free USA Today, free Wi-Fi Internet access, guest laundry and dry cleaning service. Book a full kitchen suite for added convenience. Public transportation is just one block from our hotel in Orlando. At Enclave Suites Orlando enjoy a fantastic location near the major theme parks and all the amenities you want. From the complimentary Grab ‘n Go breakfast to the two outdoor swimming pools, plus the indoor heated swimming pool and the lighted tennis court, the Enclave Suites offers much more than any other hotel in Orlando. Whether you are relaxing in the tropical pool area or taking a thrill ride down one of our multiple water slides, there is something for everyone at CoCo Key. Experience our 6,500 sq. ft. interactive arcade with state-of-the-art video games. Fitness center, convenience store, and business center are also located on property. Located only minutes from the main Theme Parks in Orlando. Amenities at Westgate Town Center include a full living room with queen sleeper sofa, fully equipped kitchen, dining area, jetted marble tub, washer/dryer, and private patios or balconies. Guests enjoy 14 swimming pools, a fitness center, lighted basketball and tennis courts, volleyball courts, and a game room. Vacation Village at Parkway is located at the intersection of I-4 and U.S. 192, the crossroads of Orlando's entertainment area. Five minutes from your door you'll find the Walt Disney World® Resort where your family can enjoy the fun and magic of the Disney-Hollywood Studios®, The Magic Kingdom®, Epcot®, Disney's Animal Kingdom® Theme Park, and more. Enjoying a family vacation in Orlando Florida is an experience of a lifetime. Approximately 62.7 million people visit the Orlando theme parks every year. Thousands of accommodations are provided for the visitors, but one segment of the vacation industry that has become extremely popular is the Vacation Ownership Resort. We offer you discounted vacation packages with the intention to introduce you to this great concept of vacation ownership. Attend an informative 90 minute Timeshare preview presentation and enjoy these great savings. Orlando Vacation Packages are an economical alternative to a family vacation, in particular the ones sponsored by the local Timeshare companies. This is a one-time opportunity to experience this popular way of vacationing known as Vacation Ownership or Timeshare Vacation. Over 9.2 million people own a Timeshare Product at a vacation destination around the world. THIS ADVERTISING MATERIAL IS BEING USED FOR THE PURPOSE OF SOLICITING SALES OF TIMESHARE PERIODS. THIS ADVERTISING MATERIAL IS NOT AN OFFER TO SELL NOR A SOLICITATION OF AN OFFER TO BUY TO RESIDENTS OF ANY STATE IN WHICH REGISTRATION REQUIREMENTS HAVE NOT BEEN FULFILLED.